From our mooring at Llanfoist (above Abergavenny) we cruised down to Pontemoile basin, in Pontypool, where the former Brecknock & Abergavenny Canal had an end on junction with the Monmouth Canal. 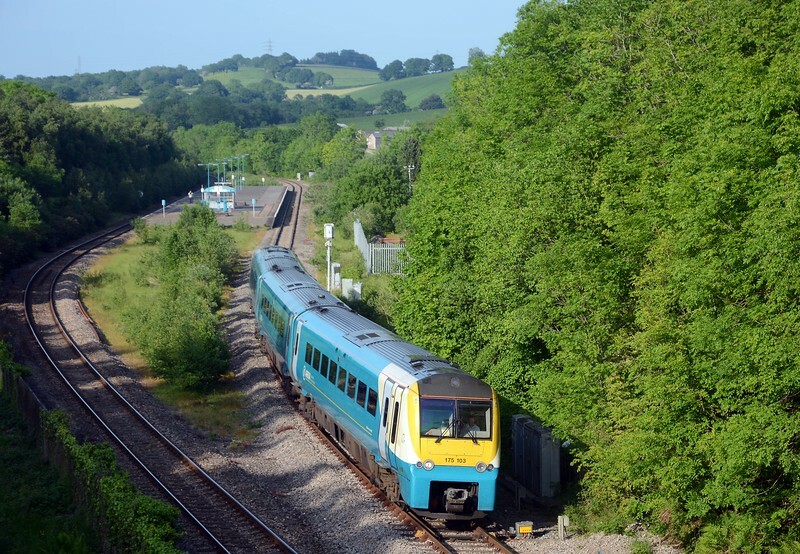 We arrived just after 17:00 which gave me enough time to search out some likely picture taking locations for a shot of the 17:16 Cardiff to Holyhead. Unfortunately the locations I looked at were all unsuitable, this shot, alongside the dual carriage way A4042 is the best of a bad job, but I got here just as the 17:16 was pulling out. So here as consolation is the 15:30 Manchester Piccadilly to Carmarthen (Pontypool and New inn 18:23).